I’ve been brainwashed. I didn’t realise it until last night, but I know every damn word to every damn song The Beatles ever released. I thought I was a fairly ambivalent consumer of their music – not because I dislike it, but because I don’t listen to it with any particular feeling one way or the other. I think it’s because I don’t have a memory of discovering their music the way I do other artists. They’ve just kind of always existed in my periphery, taken for granted like a pair of comfy slippers or the family dog (note to my dog, if he’s reading this – I do NOT take you for granted, buddy. Now don’t pee on anything before I get home). Arriving for last night’s performance of Lady Beatle, my interest was therefore in Naomi Price. Loved by audiences for her work in cabaret and theatre, Price is also known for producing some of the wittiest and most engaging performances through her production house The Little Red Company. Along with her writing partner Adam Brunes, Price has been rolling out some cracker shows over the last five years. 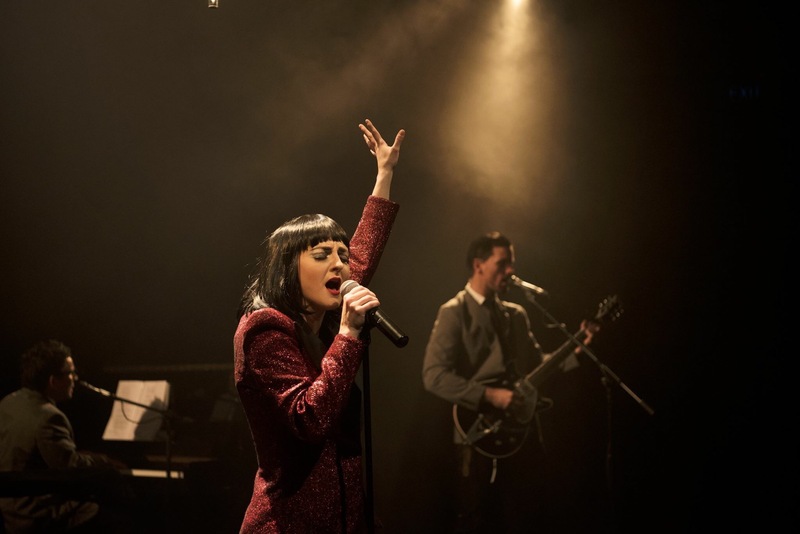 Rumour Has It, based on the life of singer Adele, is still in rotation; and Wrecking Ball, a take on Miley Cyrus’s career, wowed audiences at both the Judith Wright Centre and Brisbane Powerhouse throughout its debut and return engagement. I was keen to see if their latest offering, billed as a ‘modern memory play’, would live up to past history. Put simply, it does. I’d heard whispers from close friend (and Lady Beatle costumer) Leigh Buchanan, that it was good, but he says that about almost everything. My father on the other hand…is too old to bother with anything that doesn’t genuinely excite him. He had to be coerced into joining me, but by the time Price was two beats into the opening number, his right foot was tapping. He was still rocking out in the carpark 90 minutes later. Price and Brunes are impressive storytellers, weaving an engaging new narrative through songs we already know so well. Unlike the usual naffness – yes, it’s a word – of rock music biopics (I’m looking at you, Mamma Mia), each transition from script to song is fresh and unpredictable, with some truly beautiful arrangements only enhancing the originals. Rather than wishing they hadn’t altered a classic, I found myself actually hearing the lyrics, and therefore the sentiments, for the first time. It’s some hard-core talent that can achieve that balance. Bathed in Jason Glenwright’s evocative lighting design, Price has never looked or sounded better. Supported by four of Brisbane’s top musicians (Drums: Mick Easterman, Bass: Andrew Johnson, Keys: Michael Manikus & Guitar: Jason McGregor), she positively soars through the emotional rollercoaster that is Lady Beatle. More than once, I was reminded of Bette Midler’s ability to manipulate an audience as I simultaneously leaked tears of joy and sadness. How she backed up for a second show less than an hour later, I’ll never know. Naomi Price and Adam Brunes seem strangely adept at picking what will resonate with audiences. At some point, the name ‘The Little Red Company’ must surely become synonymous with ‘hit show’. Well…that, or she & Brunes might write a real turkey and prove to us they’re mortal. Having seen how the audience responded to last night’s performance though, the former seems more likely than the latter. NB: My parents weren’t the only boomers in the audience, and it was great to see a different crowd to the usual hipsters, students and angsty art types. The bar, finally refurbished and with a rare audience of people willing to spend money, didn’t know what to do with themselves as they tried to serve the throng. If nothing else, Lady Beatle has opened one of Brisbane’s best theatre companies up to a whole new audience who might otherwise not have made the trek to Kelvin Grove. Fingers crossed they caught the Lady Beatle bug, and will support La Boite again.